The new X-Men: Gifted T.V. show has been green lit by Fox and casting is now underway. One of the characters that has already been cast is that of Blink. She will be played by Jamie Chung. The T.V. version of Blink is going to go by the name of Clarice Fong instead of Ferguson like it says in the key issue notes. I'm not sure why writers or producers felt like they need the name change, but it is what it is. This isn't Chung's first time being affiliated with an X-Men project. In 2011, she voiced the character of Aimi Yoshida for the X-Men Destiny video game. This also isn't the first time we'll see a live action version of Blink. We got to see her and her cool mutant abilities in the 2014 movie X-Men: Days of Future Past, which, in my opinion, was one of the better X-Men movies to come out. Like I already mentioned, Blink's real name is Clarice Ferguson. She has the ability to teleport large masses and groups of people. If she's feeling especially gruesome, she can teleport only a portion of her enemies. like an arm, a leg, or maybe just the head. That would make for a pretty nasty scene. She can also create portals that can divert an oncoming attack from an enemy. These portals are accompanied by a "blink" sound, which is where she probably gets her nickname from. 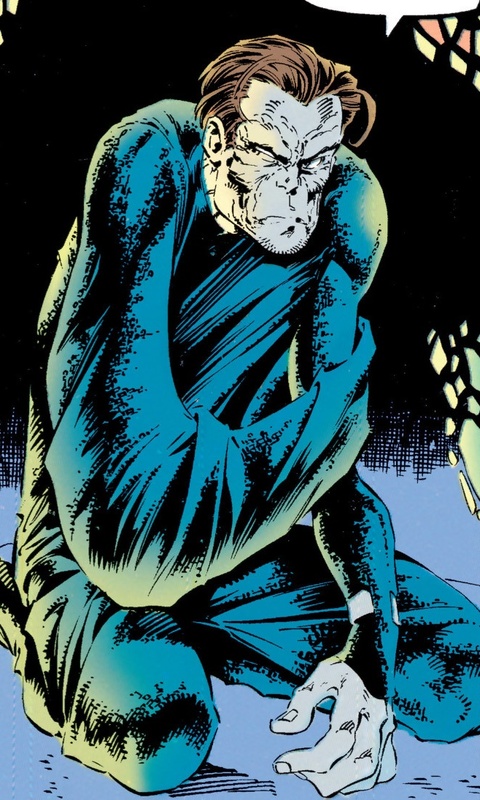 The next mutie to make his first appearance in this issue is Angelo Espinosa, also known as Skin. Espinosa's nickname is very fitting, because he has roughly six feet of extra skin that he can manipulate at will. He isn't like Reed Richards of the Fantastic Four though. Espinosa only has control of manipulating his skin, his skeletal structure stays the same as any other non mutant. When we first meet these two, they are being held captive by the Phalanx, a cybernetic race that joins with human hosts and become part of a collective. They remind me of the Borg from Star Trek. 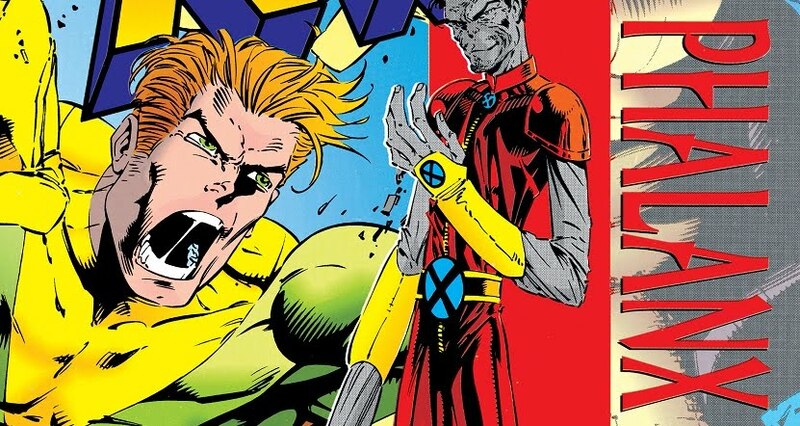 The Phalanx have captured these two, and a few other mutants, to experiment on them because, for some reason, the Phalanx can't assimilate mutants into their collective like they can with non mutants. At the end of the story, all of the captured mutants are able to escape confinement and join together to form the team Generation X, although they aren't named as such in this issue. 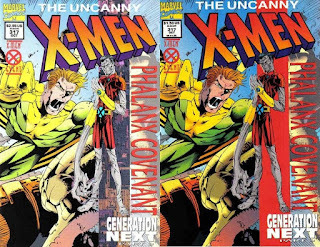 There are multiple websites that state that this issue has the first appearance of the team, but there are others that claim that Uncanny X-Men #318 is the first appearance. I'm not sure which is correct, but they all leave their captivity together and continue on with the same purpose, so it kinda seems like they unofficially formed a team to me. However, over at Comic Vine, they state that the first appearance of Generation X is in the pages of Marvel Annual Report #4. Now, if you're not familiar with these books, they are what the title says. Marvel took their usually boring market reports that they give to investors, and turned it into a comic, just to make it a little more interesting to read. 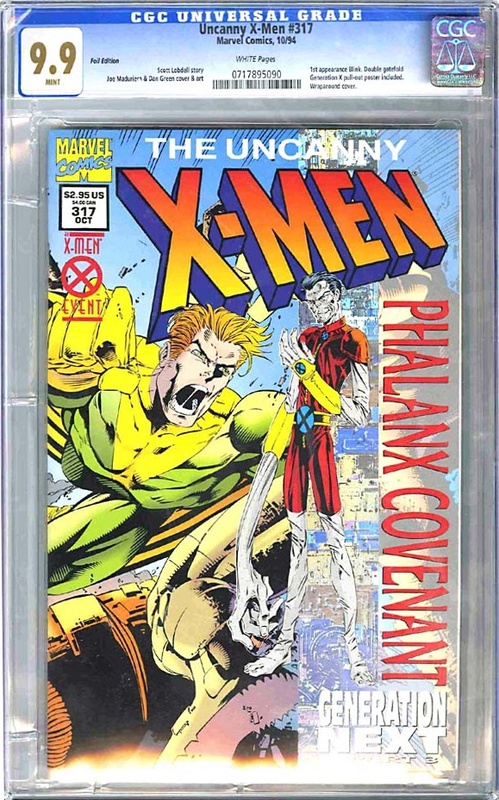 It's mostly accounting numbers and sales mumbo jumbo, but there are copies out there in the secondary market and do sell for a decent amount of money, not because it holds the first appearance of Generation X, but more likely because they weren't overly printed and can be harder to find. If you notice, in the key notes list, I put "the first full appearance" of the two characters. In the Vol. 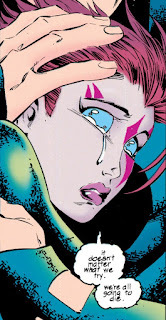 2 series of X-Men #36, there is a panel that clearly shows them. I'm not sure if that would be considered a cameo or not, but they definitely make an appearance in that issue. X-Men Vol. 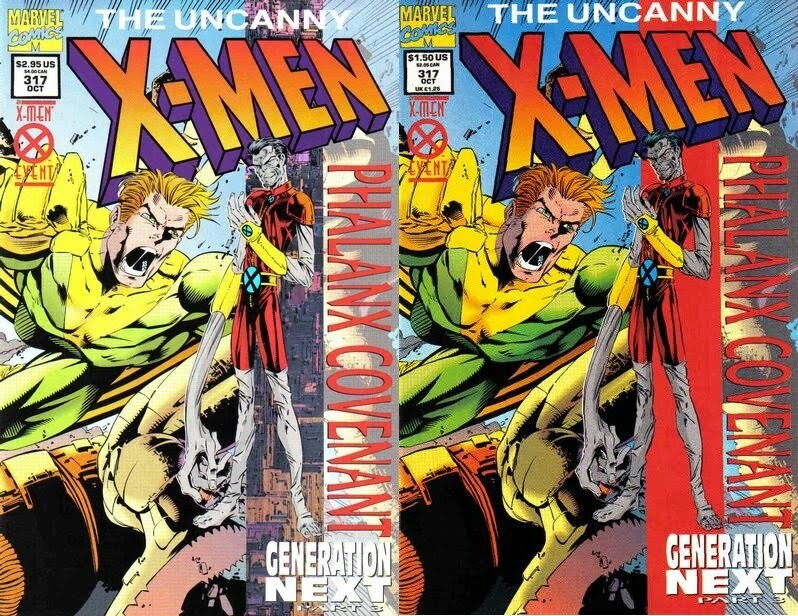 2 #36 was published in Sept. of 1994, a month earlier that this issue of Uncanny X-Men. If you are a variant hunter, or a completionist, there are two versions of this comic for you to hunt for. One is recognized as the Foil Edition by CGC. This variant is the Direct Market version. There is also a version that has a red stripe which replaces the foil. This version is the Standard Newsstand Edition. Unfortunately I don't have any print run information for either one of these variants, but both of these versions are not hard to come by. There are far more Foil Editions available than there are of the Newsstand Edition, but that was how the market was focused back in the 90's. If you're unfamiliar with the difference between the Direct and Newsstand editions, there is a great article explaining it here. Since CGC is the only company with a census, I will be using their numbers for this section. CGC does differentiate between the two variant editions that I talked about above, and there are far more of the Foil Editions registered than there are Newsstand. 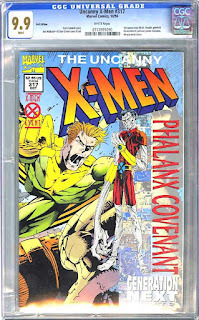 To date, there have been 308 copies of the Foil Edition graded as opposed to only 43 of the Newsstand copies. Most of both versions are very high 9.8 NM/M copies, a little over 270 of em. These numbers are low, at least for now anyway. I'm not sure how many people know about the first appearance of these two characters, of if people are just doing the "wait and see" thing to see if it's going to be worth submitting this comic. This key issue is still a very affordable comic, even in high grades. There haven't been a ton of them, but recent sales for 9.8 NM/M copies have only been in the $30 - $50 range. It has come down significantly since the X-Men Days of Future Past hype back in 2014. Copies at that same grade were dropping at the $100 and over range back then. It is possible that this comic could see another boost in demand, especially if the T.V. show turns out to be any good. The latest auctions on eBay for 9.8 copies have been listed at just under the $100 mark, so if collectors start jumping on those copies, we'll definitely see this books value start to rise again. It seems to me that this comic is still under the radar as far as key issues go, especially for a fan favorite character like Blink. It could be that there are just so many other key issues that people are gunning for, this comic is getting overlooked, but who knows how long that is going to last.